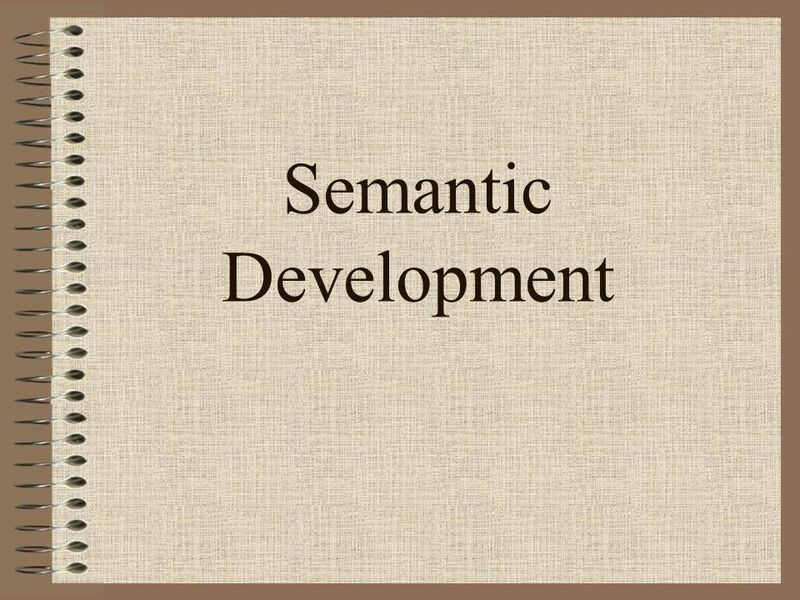 2 What is Semantic Development? 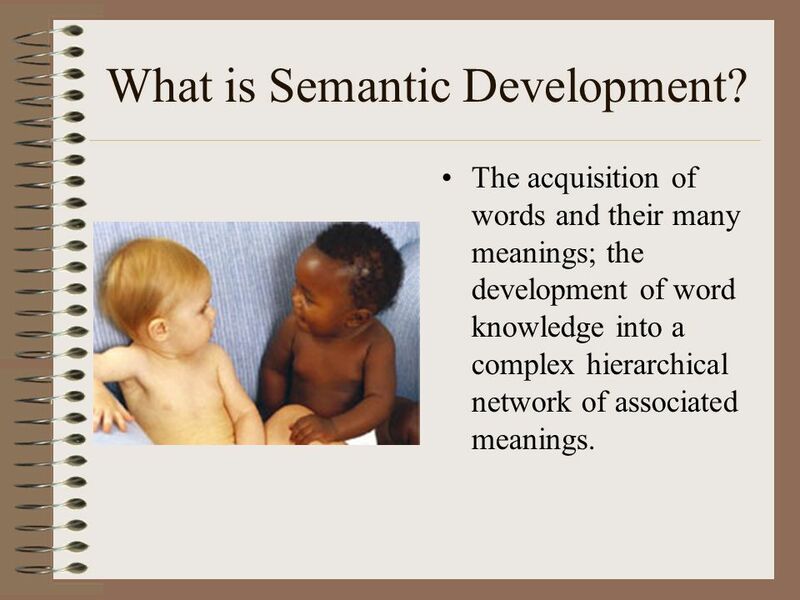 The acquisition of words and their many meanings; the development of word knowledge into a complex hierarchical network of associated meanings. 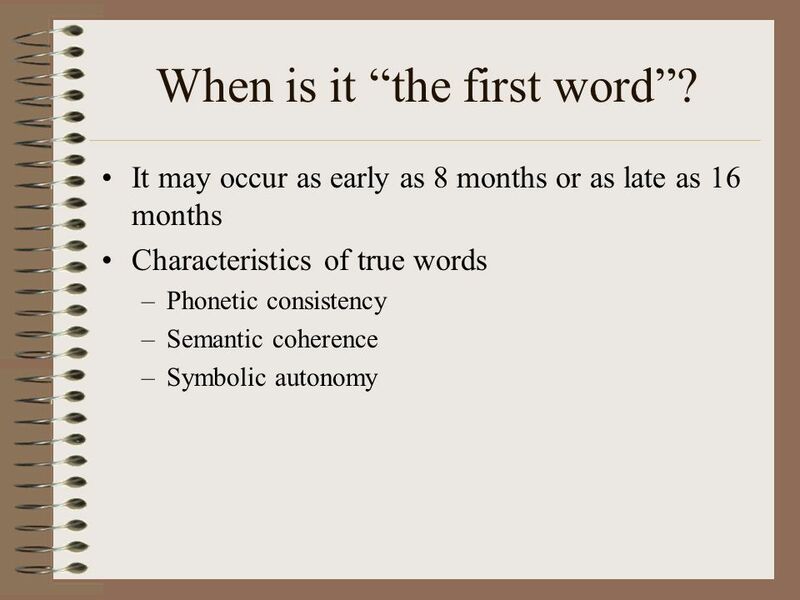 8 When is it “the first word”? 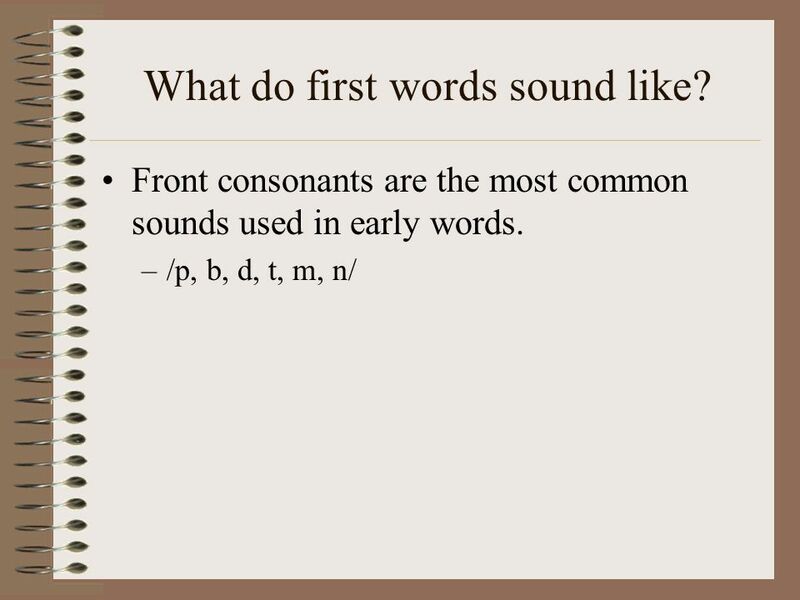 12 What do first words sound like? 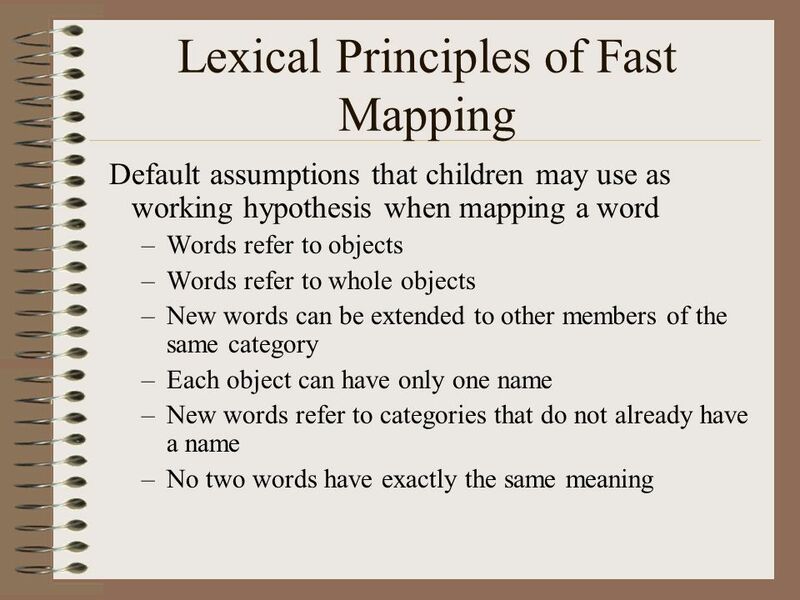 13 How fast does the first lexicon grow? 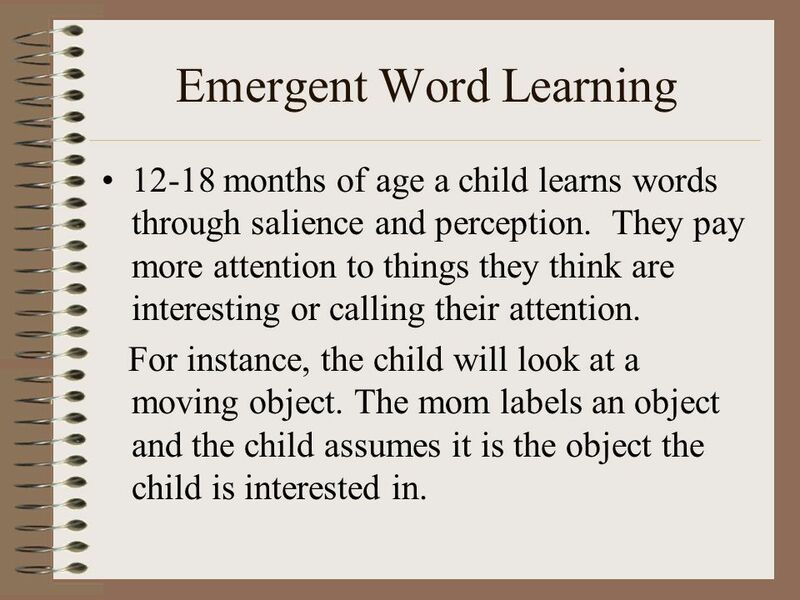 12-18 months of age a child learns words through salience and perception. They pay more attention to things they think are interesting or calling their attention. For instance, the child will look at a moving object. 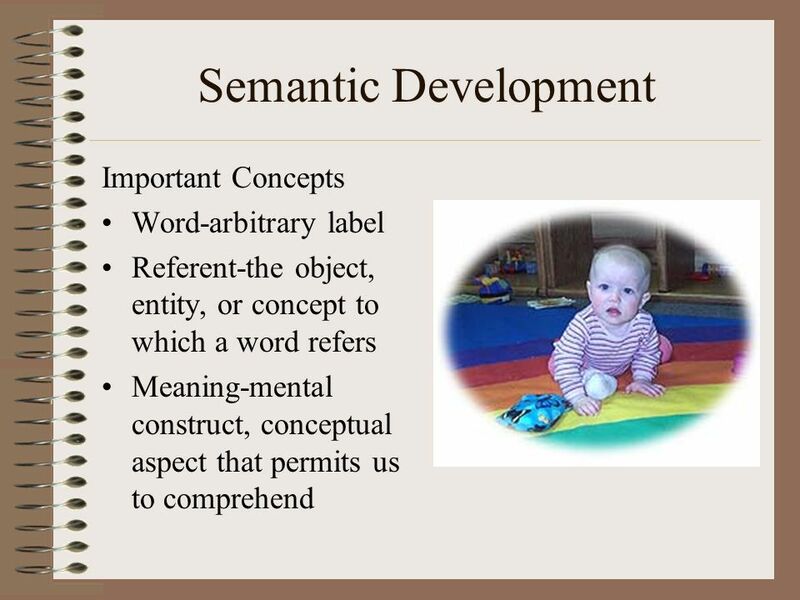 The mom labels an object and the child assumes it is the object the child is interested in. 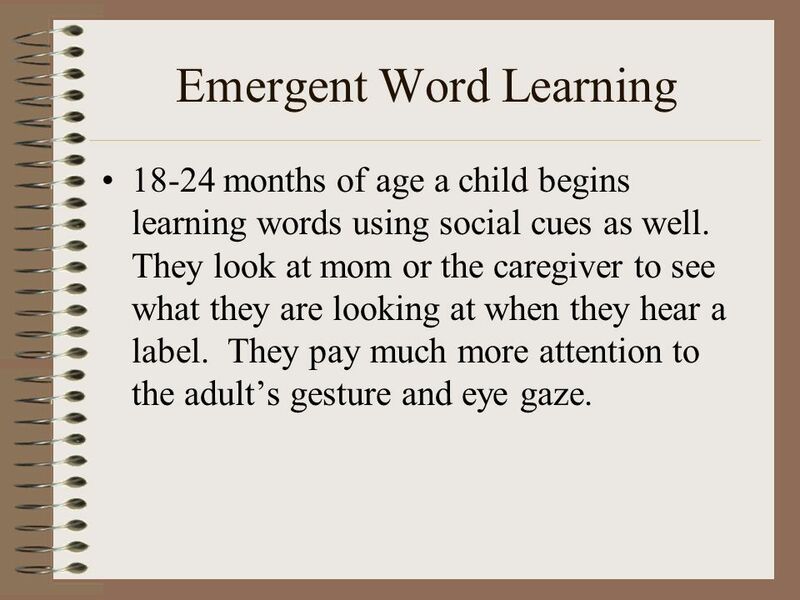 18-24 months of age a child begins learning words using social cues as well. They look at mom or the caregiver to see what they are looking at when they hear a label. They pay much more attention to the adult’s gesture and eye gaze. 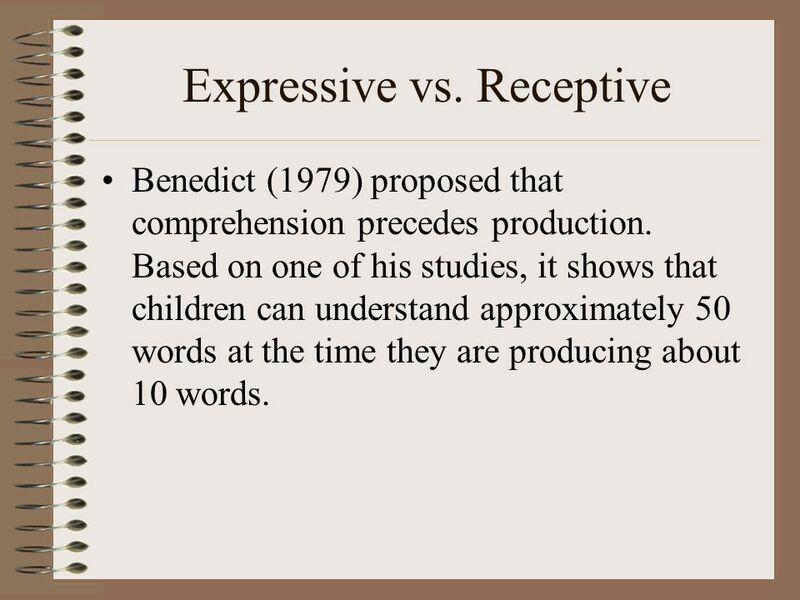 Benedict (1979) proposed that comprehension precedes production. 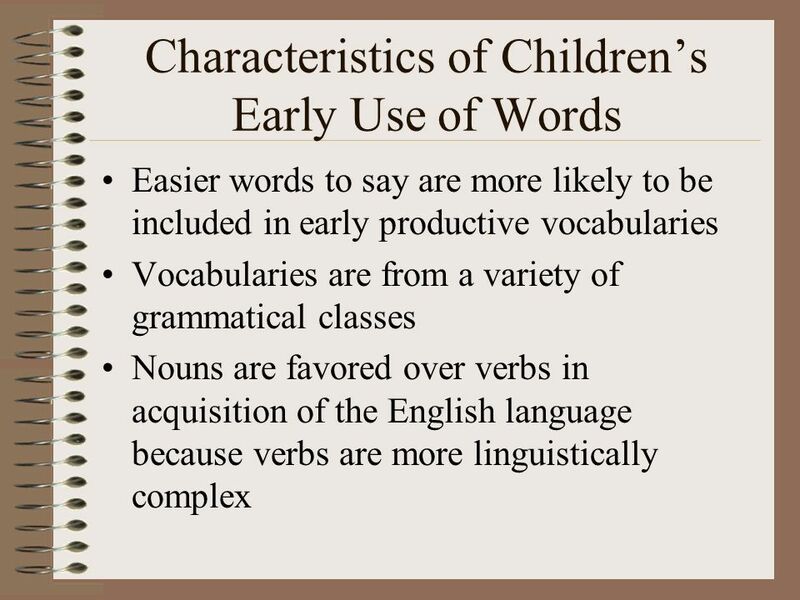 Based on one of his studies, it shows that children can understand approximately 50 words at the time they are producing about 10 words. 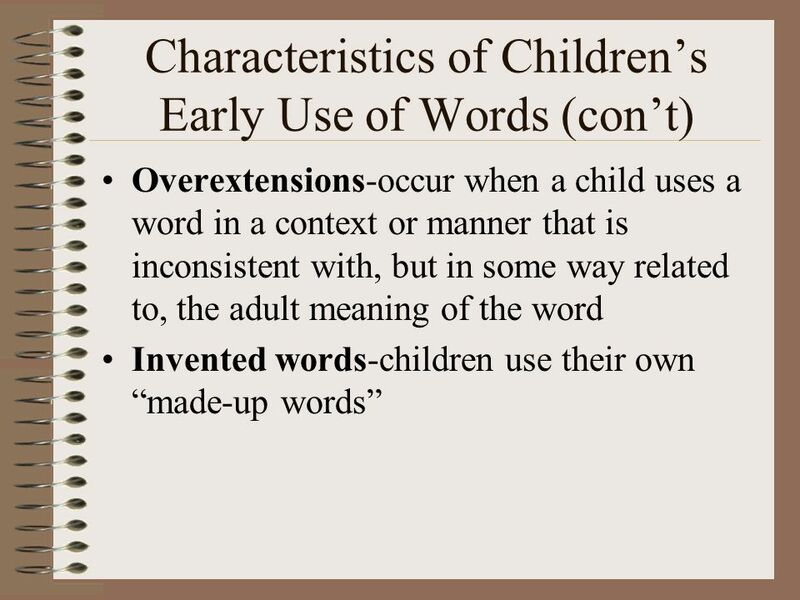 If during the 2nd year of life a child shows such a drastic increase in vocabulary usage, it is assumed that the child is using words they already understand. 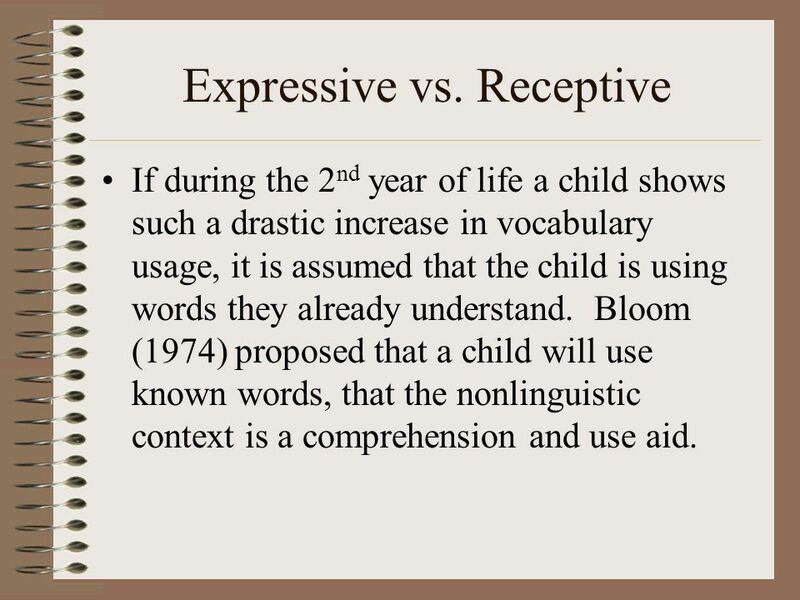 Bloom (1974) proposed that a child will use known words, that the nonlinguistic context is a comprehension and use aid. 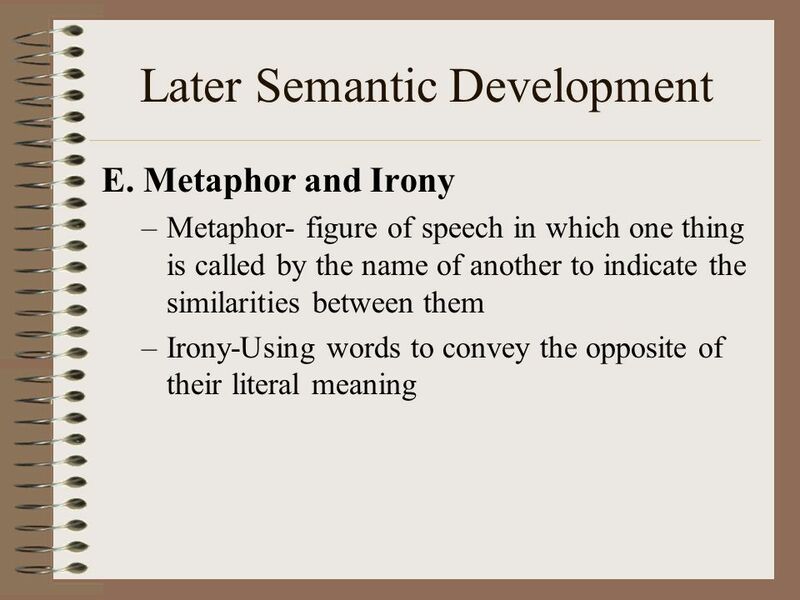 21 Slow Mapping The principle of enriching your semantic representations of words already fast-mapped into your lexicon. 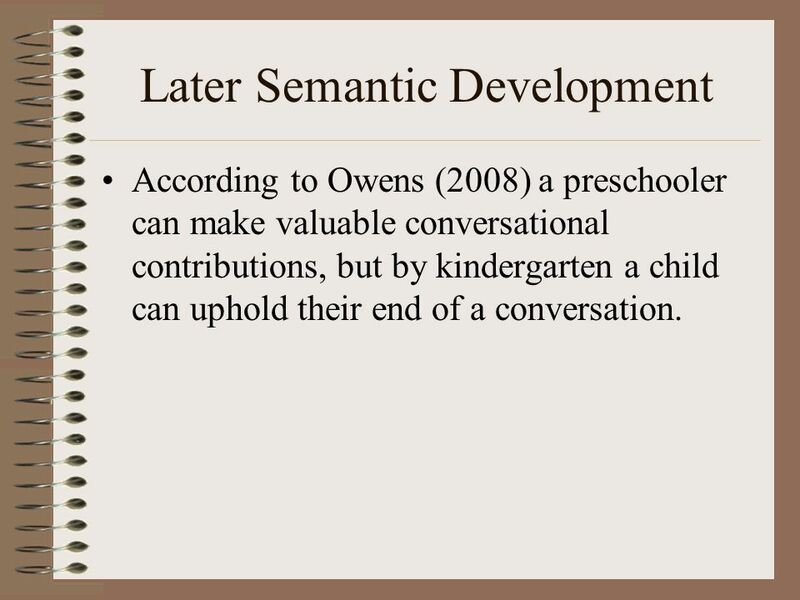 According to Owens (2008) a preschooler can make valuable conversational contributions, but by kindergarten a child can uphold their end of a conversation. 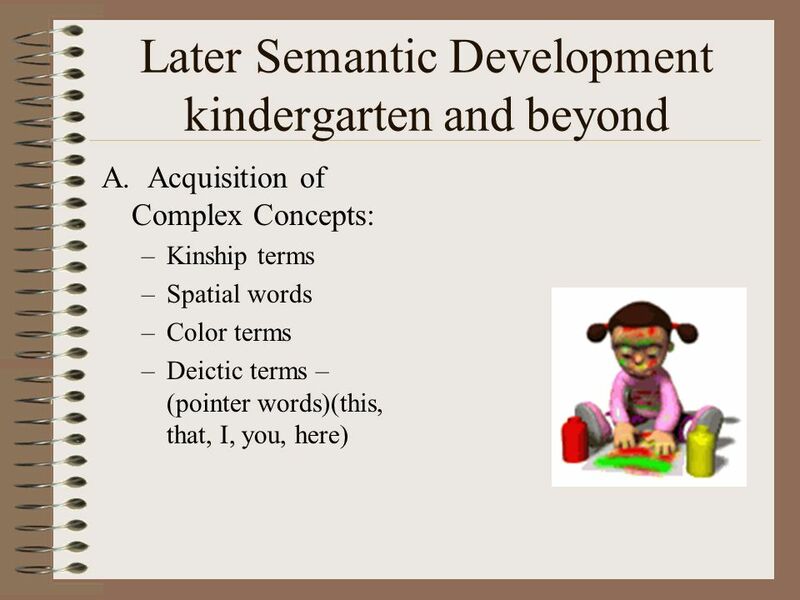 A preschooler advances from 1- to 2- to multi-word sentences, whereas from kindergarten and beyond a person will become more adept at vocabulary use, concept use, narrative discourse, etc. 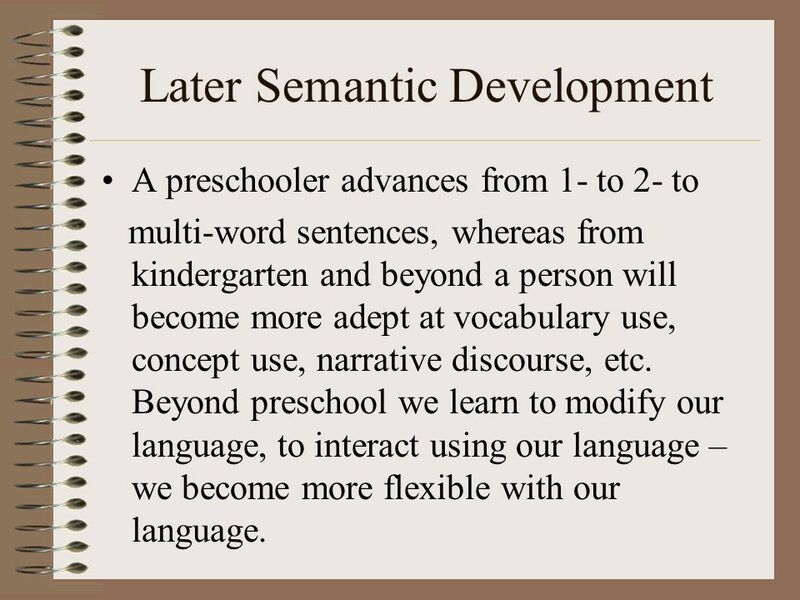 Beyond preschool we learn to modify our language, to interact using our language – we become more flexible with our language. 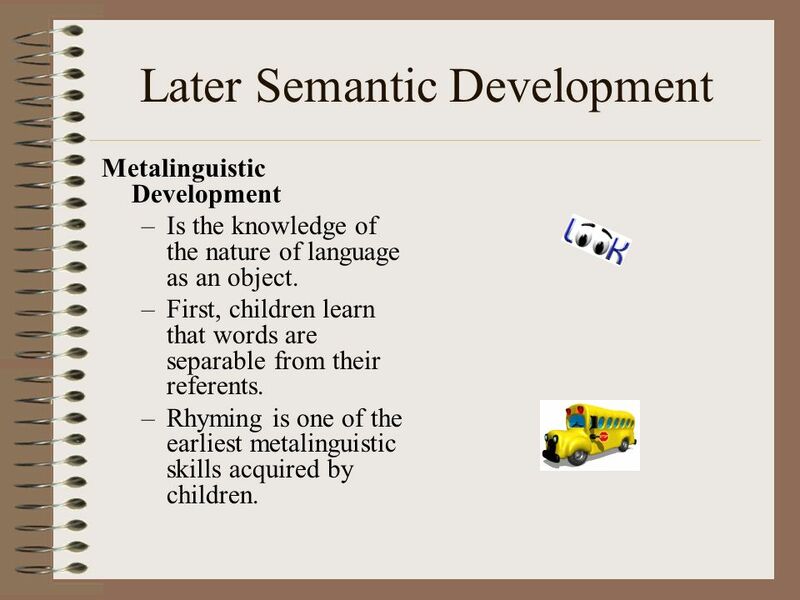 Metalinguistic Development Is the knowledge of the nature of language as an object. 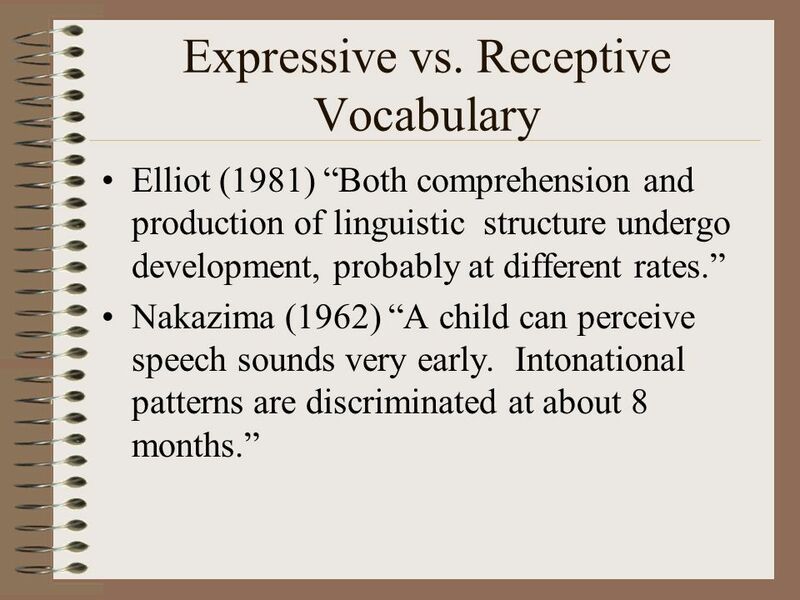 First, children learn that words are separable from their referents. 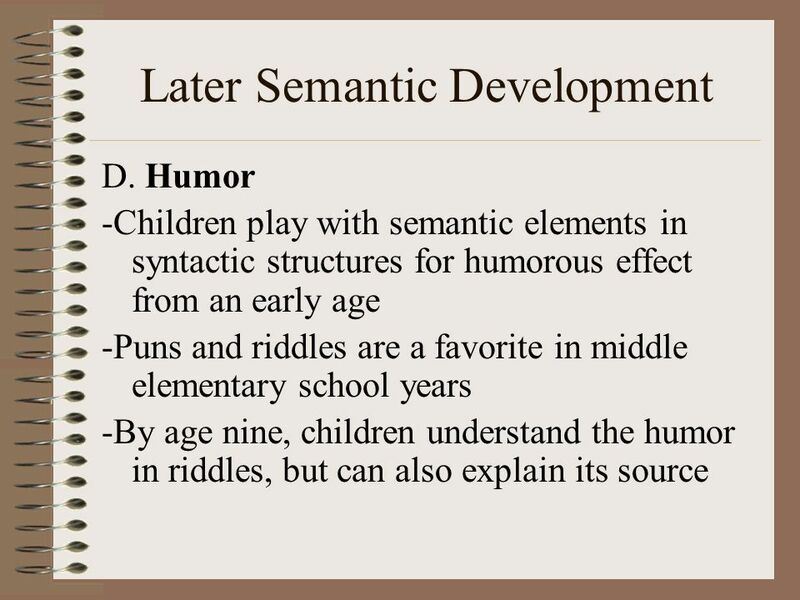 Rhyming is one of the earliest metalinguistic skills acquired by children. 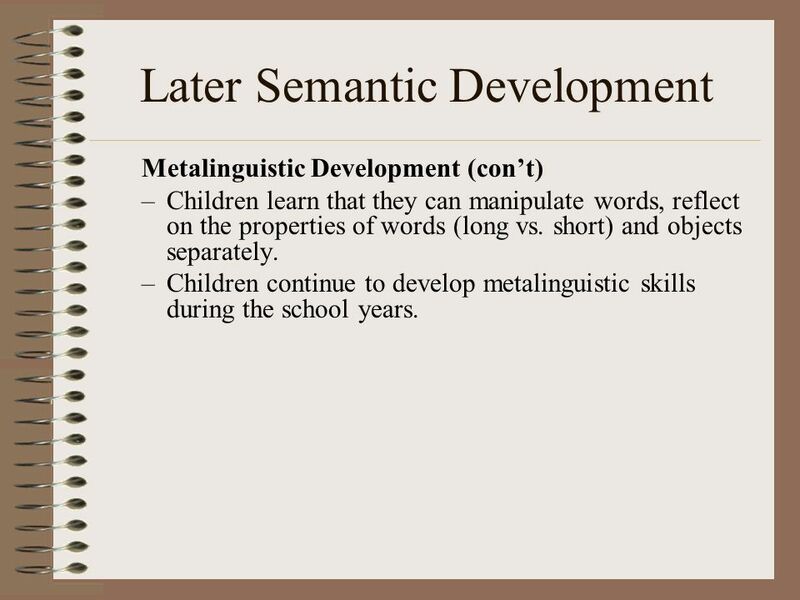 Metalinguistic Development (con’t) Children learn that they can manipulate words, reflect on the properties of words (long vs. short) and objects separately. Children continue to develop metalinguistic skills during the school years. 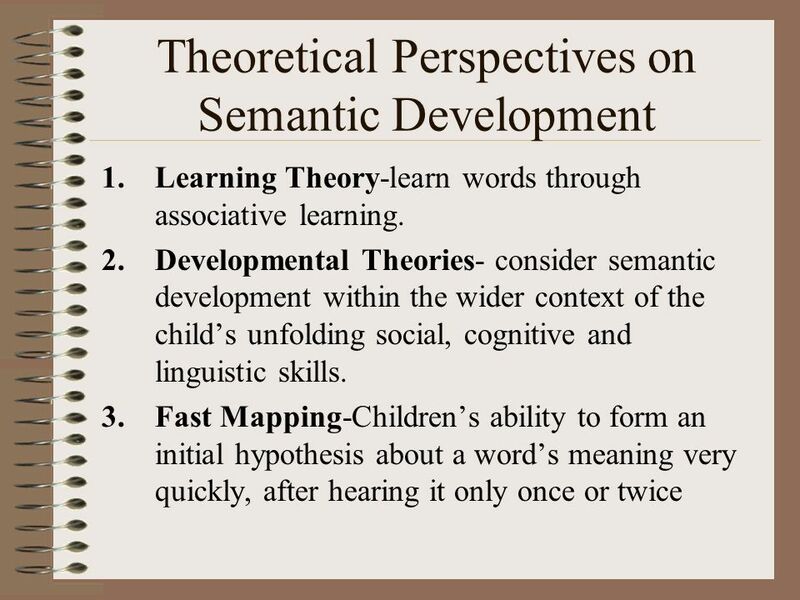 Early Attachment and Later Development Thompson, R. A. (1999). 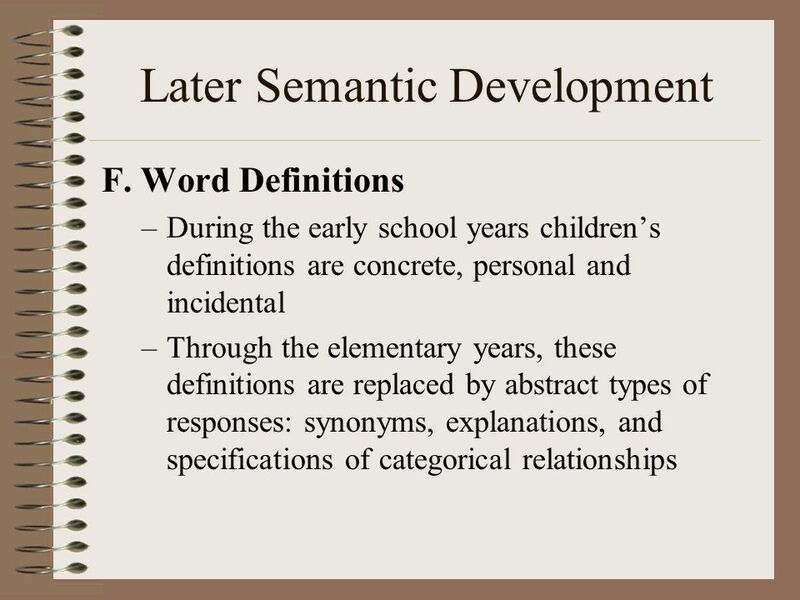 Early attachment and later development. In J. Cassidy & P. R. Shaver (Eds. ), Handbook of. 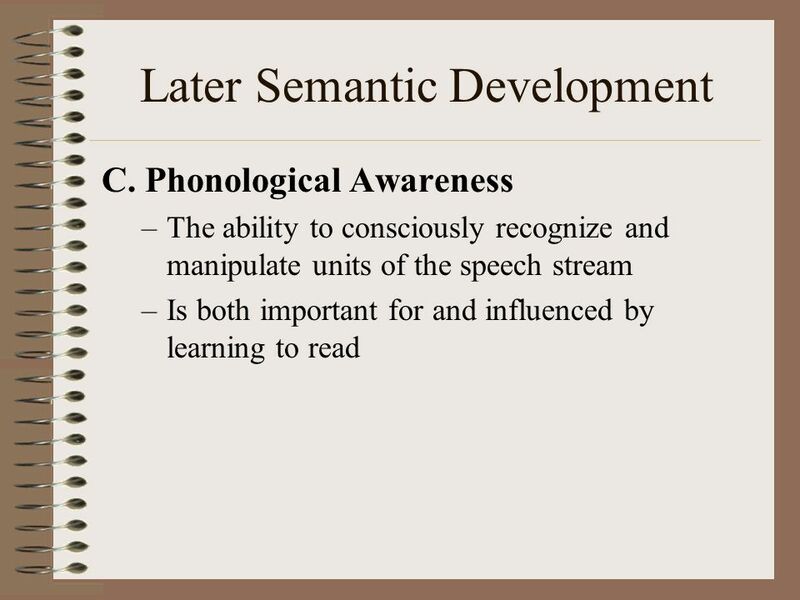 * Cognition: mental processes involved in acquiring knowledge. 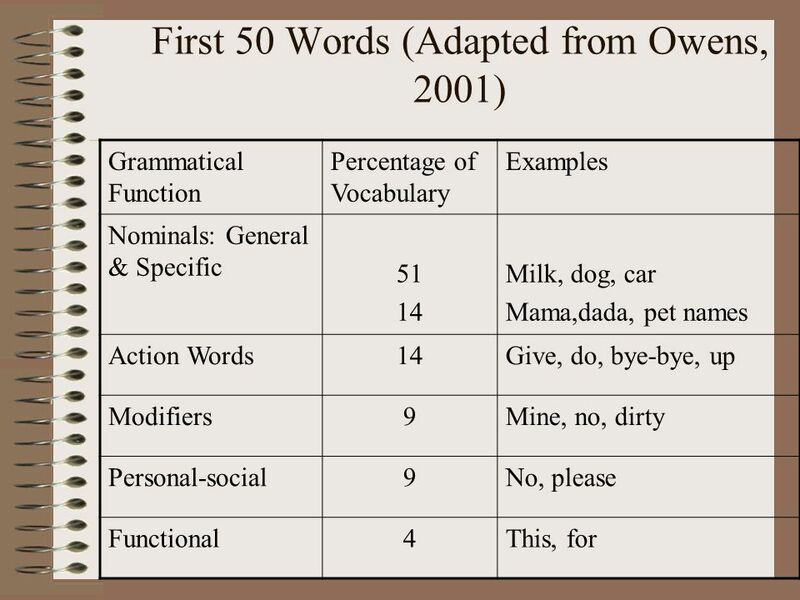 Language Acqisition - From Womb to School. 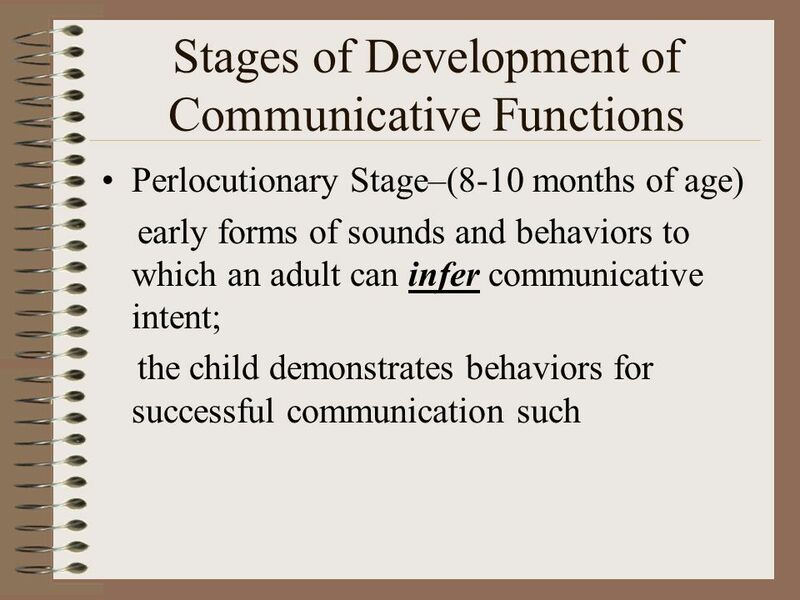 Content Pre/Postnatal Language Development The First Three Years The Pre-School Years The School Years. Chapter (7), part (2).  Intentions in words. 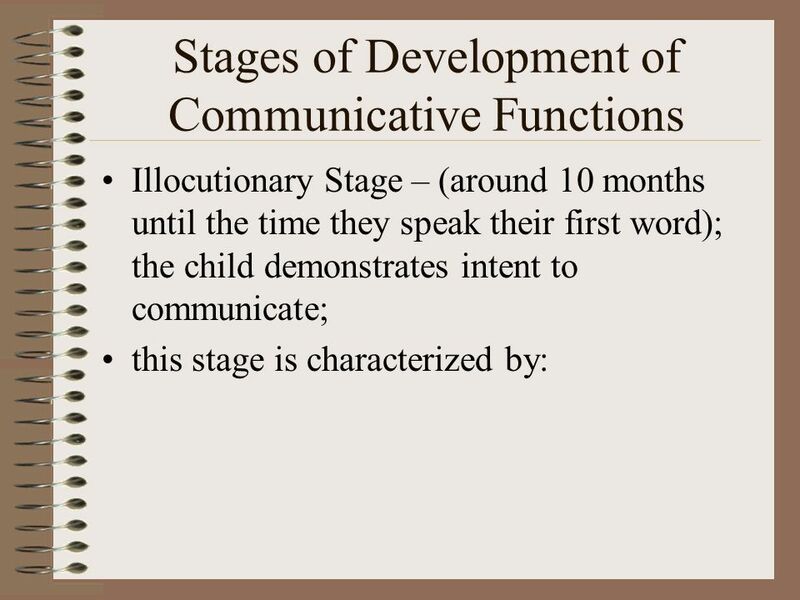 First words fulfill the intentions previously expressed through gestures and vocalization. Very different. 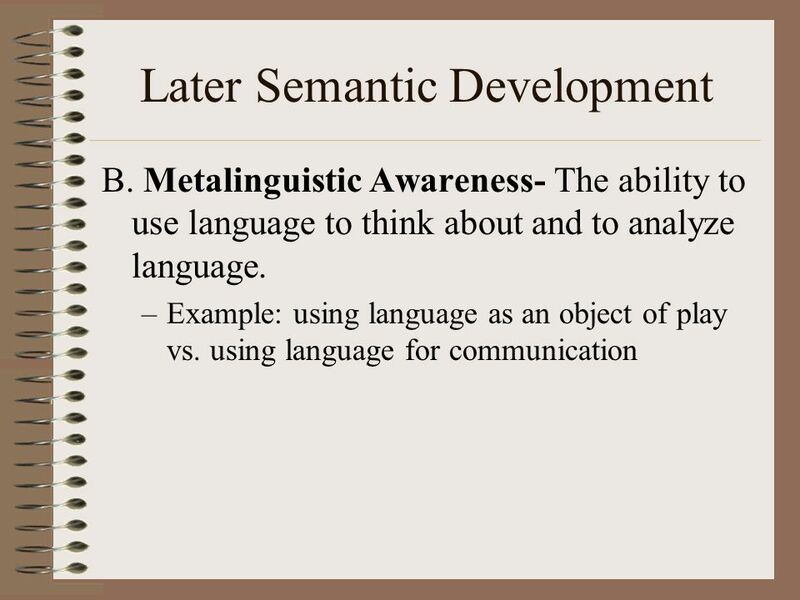 Language Development Major Questions: 1) What is language/what is involved in language? 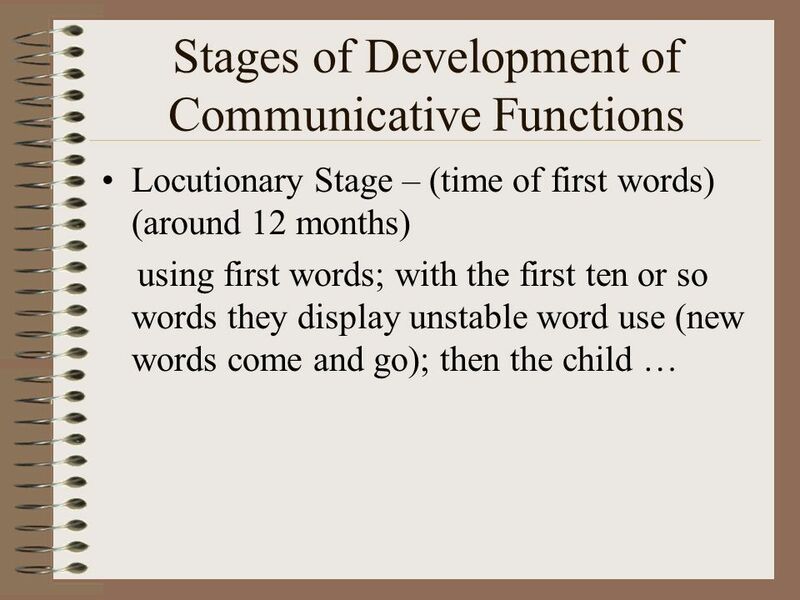 2) What are the stages of language development? 3) Is language.